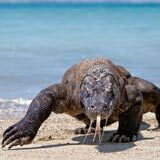 Komodo Dragon Tour Package 4 Days 3 Nights From Bali is one of our Komodo Tour Package to visit Komodo National Park and surroundings. This Kind of Komodo Tour Package is not only focus to see Komodo Dragon in the wildlife but you also can enjoy other destination around Komodo National Park and the underwater marine life by doing snorkeling activity. 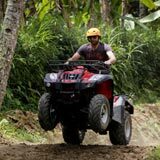 Pick up from your hotel in Bali and transfer to the airport, for flight to Labuan Bajo (West Flores) for approximately one and half hours. On arrival in Labuan Bajo will be welcomed and meet by our local representative and direct check in at hotel. Lunch at local restaurant. 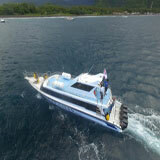 After lunch, proceed sail to Bidadari for swimming, snorkeling and relaxing in an spoiled color reef coral and fish. Dinner and overnight at Standard hotel. 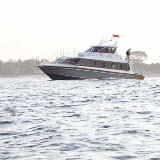 Breakfast at hotel, early morning pick up and tranfer to the harbor sail to Komodo Island. 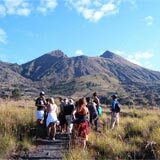 On arrival, start your trekking, walking through to the typical forest to explore the wild life of Komodo Dragons and others wild animal (deer, pig, monkey, buffalo's and many kind of birds). A local ranger will be leading you to this nature preservation. After trekking, back to the boat proceed to Pink Beach for swimming, snorkeling and relaxing in unspoiled coral reef and many color of fish. 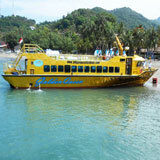 Lunch will be served on board, before we continue our trip to Kalong Island. Dinner and overnight on boat. Early morning breakfast on boat, sail to Rinca Island. 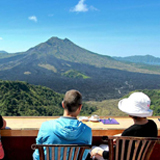 Rinca Island a nother chance to explore the wild life of komodo dragons and other animals. Lunch will serve on boat. After wards, sail back a cross to visit the Warloka primitive village. See the stone post dolmens, menher and ancient ceramics. After that, sail back to Labuan Bajo and directly transfer to the Golo Hilltop Hotel or similar for dinner and overnight. Breakfast at hotel. Short city sightseeing will be made, visiting to the local market and see the huge Batu Cermin (Mirror Cave) before transfer to the airport for fly back to Bali. 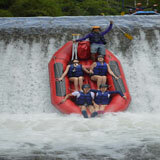 On arrival in Bali will transfer back to your original hotel. Rount Trip Airplane Ticket (Bali - L.Bajo & L.Bajo - Bali). Land & sea arrangement service. Full board meals: 3x breakfast, 3x lunches & 3x dinner. Coffee, tea, and mineral water. Park admission & park ranger service. Camera fee, video camera fee & donations.